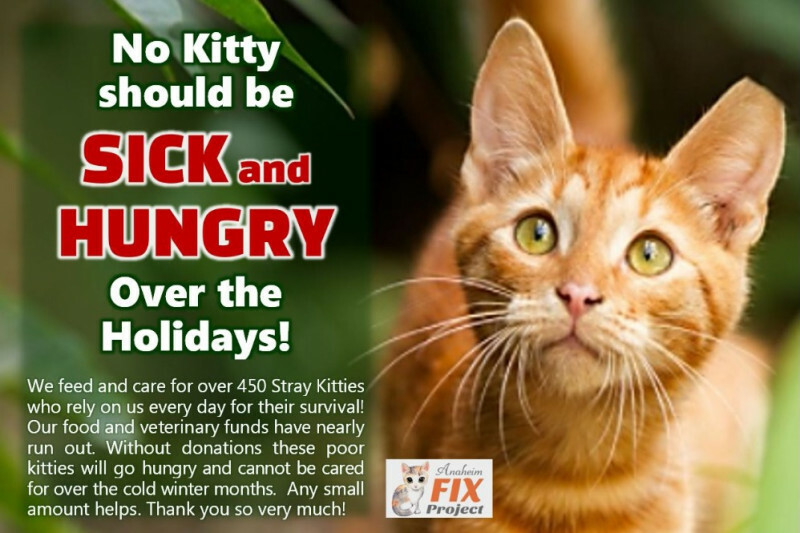 Over 450 Hungry Stray and Abandoned Kitties are at Risk of Going Without Food or Vet Care this Cold Winter! The Anaheim Fix Project volunteers go out every day to the streets alleys, parks and neighborhoods of Orange County to feed, fix, rescue and care for over 450 stray and abandoned kitties who depend on the volunteers for their lives. Thank you so much to you kind people who have donated before, but sadly funds have again run dangerously low. Food costs are approx. $3,500 per month plus there are spay/neuter/vaccine (TNR) costs and there are also often emergency vet bills to help sick and injured kitties. No kitty should be left cold, hungry and vulnerable on the streets! We can't keep the kitties fed and cared for through the tough winter without your compassionate holiday donations. Thank you for your kindness to kitties! It would be a wonderful if you could also post this on your Facebook page and/or Twitter. Just click on the button above that says 'Share on Facebook'. Thank You!! Please help! Any donation is deeply appreciated! If you would prefer to send a check to help the kitties, you can make the check out to the nonprofit : 'OC Community Cats' and mail it to: 9852 Katella Ave, #290, Anaheim, CA 92804. Be sure to write: 'Anaheim Fix Project' in the notes area of the check. They will send you a receipt. 100% of donations received from this page go to Anaheim Fix Project at OC Community Cats and Healing the Strays. All funds go directly to help the kitties. Funds are used for food, vet care, medicines and supplies for abandoned and stray Orange County cats and kittens. If you would like a tax deduction receipt, you may send a private message via the Facebook page linked above for OC Community Cats. They will gladly send you a receipt. Thank you so much for your kindness! Bless you for caring and helping!